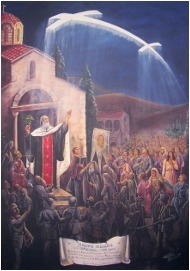 Appearance of the Cross in Athens in 1925. The depiction to the left illustrates a miraculous event from last century that occurred during a time of affliction when God visited His people with a sign in the heavens. This was the miraculous appearance of the Holy Cross in the heavens over Mount Hymettus near Athens on the eve of the Exaltation of the Cross in 1925. The adoption of the Papal-Gregorian Calendar created a liturgical schism from the rest of the Orthodox Churches and was the initial step in undermining the concept of the Orthodox Church as the singular Body of Christ in the world. Because of this, many of the faithful in Greece refused to accept these unprecedented changes that were imposed on their Church, and they strove to continue to celebrate the feasts according to the traditional Church Calendar. Some of the innovating new calendar bishops sent police into the parish churches which had rejected this innovation and the priests were arrested, and the faithful were violently beaten and dispersed. There were even cases of the Holy Table being overturned and chapels being demolished by order of bishops of the State Church of Greece. On one occasion, a young woman, Catherine Routis, was struck on the head and killed. (For an account of her life, click here.) Such was the fanaticism of some of the innovating bishops. This was a time of confusion and affliction for many Christians who desired to worship God in spirit and in truth. I was one of the men from the Police Institute who were sent to stop the vigil that night, some fifty years ago, at the country church of St. John the Theologian. The Old Calendarists were keeping vigil there, because it was the eve of the feast of the Exaltation of the Precious Cross. Since many people had gathered–more than two thousand individuals–we did not attempt to arrest the priest as we had been ordered, but we sat down quietly in the nearby court and waited for them to finish. At about 11:30 at night, we heard a loud and strange uproar coming from the shouts of the multitude. Without delay, we ran to see what was happening –and we saw. The whole multitude of the faithful was in a state of excitement. Some were weeping and others, crying out “Lord, have mercy,” were kneeling and had turned their eyes toward heaven, and yet others were fainting, overwhelmed with great emotion. Then we too looked and beheld the marvel: an enormous radiant Cross, very high above the church, was illumining the whole area. At first, we were seized with fear, but immediately we came to ourselves, and forgetting the purpose for which we had been sent, we fell to our knees and wept like little children. Of course, it is superfluous for me to tell you that, filled with emotion, we attended the rest of the vigil to the end–no longer as persecutors, but as faithful Christians. In the morning when we returned to the Institute, we told everyone about the great marvel which we had been deemed worthy to see. Afterwards there was an investigation and all of us swore under oath that we had seen the Precious Cross clearly, high in the sky. By this stupendous miracle of the appearance of the Cross in 1925 on the feast of the Exaltation of the Cross, our Savior has once again called those who wish to follow Him on the narrow way to take up their Cross and follow Him through our unflinching efforts to adhere to the Holy Tradition of the Orthodox Church. We live in an era wherein there is indifference to truth on the part of many. The calendar change was just one step in the process to undermine the teachings of the Church that we have from Apostolic times. The government-supported state churches in the Orthodox Christian homelands have been infiltrated with false shepherds who are ashamed to confess the Tradition given by Christ to His Apostles and have abandoned the Cross and betrayed the Faith. They have followed the broad way by uniting themselves with the Pan-heresy of Ecumenism through their membership in the World Council of Churches and their recognition of the priesthood and baptism of heretical congregations who teach condemned heresies. Our Savior Himself warned us with His words, “And then shall appear the sign of the Son of man in heaven: and then shall all the tribes of the earth mourn, and they shall see the Son of man coming in the clouds of heaven with power and great glory.” (Matthew 24:30) How we choose to respond to the present day betrayal of Orthodoxy will determine if we will rejoice at the Second Coming of Christ or if we will mourn at His Second Coming. At that time the Mystery of the Cross will divide all of mankind. May you not be counted as a member of “the tribes of the earth” in that day, but rather, may you be counted as a member of the Tribe and Household of God, a member of the Body of Christ, by your taking up of your cross through a good confession of the faith. [i] The Gregorian Calendar was invented by the astronomers of the heterodox Pope of Rome, Gregory, in the 16th century and it became the liturgical calendar of the papists from that time. This arbitrary change of the calendar in the west was condemned in the Orthodox east for many reasons, but one reason was that no single bishop or local Church had the right to change the calendar without an Ecumenical Council. Just as the Julian Calendar was fixed by an Ecumenical Council, so also, any changes would have to be made by a legitimate Ecumenical Council. In the 16th century the calendar change was seen as an attempt to establish the principle of the primacy of the Pope over all bishops and councils of bishops. Subsequent events demonstrate that the change of the calendar in 1924 was a first step towards uniting with the heterodox churches of the west, guided not by Christian love of the truth, but rather, guided by politics and indifference to Apostolic Tradition.